Get to know and reach out to the experts at Profil. Leona has profound scientific and medical expertise in the field of obesity, diabetes, and metabolism. She has a strong background of research in both academic and industry environments with particular know-how in in basic science in molecular endocrinology and energy metabolism as well as translational clinical research and early-phase clinical development for obesity and diabetes. 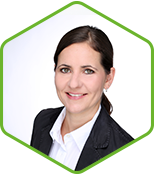 At Profil she is CEO of our Mainz site. Additionally, she is experienced in the development process of bioactive food compounds for nutraceutical applications. Dr. Plum-Mörschel is an active academic lecturer and member in both diabetes- and endocrinology-related professional scientific societies. In combination with the unique experience in diabetes and cardio-metabolic research, the expertise in nutritional sciences and the availability of a metabolic ward at Profil, the Obesity & Prediabetes Department facilitates the design and conduct of intelligent and comprehensive clinical trials focusing on body adiposity, either as a primary focus or as a means to improve glycemic control, metabolic disease risk, or other significant comorbidities. Browse Profil's list of publications to see our other publications.